Today is Tax Day. And that can be a bummer day. However, Saturday is going to be awesome. Why? Because there will be Bake Sales across the country on Saturday, April 17th to benefit Share Our Strength! To see the listing of the Los Angeles bakers, click here. And if you want to donate but can't make it, you can donate an online contribution here. Hi Mary. I will be moving to LA in late June and would love to get involved in food blogger events like this. Where does one find out information about participating? Thanks! Hope you will be here to join us. For this Saturday's event, Gaby of What's Gaby Cooking organized it. What a wonderful generous idea. My daughter organized a "Great American Bake Sale" at her summer camp program many years ago - such a great program. Thank you for taking part. Happy baking! Cinnamon chocolate is one of my favorite flavor combos. 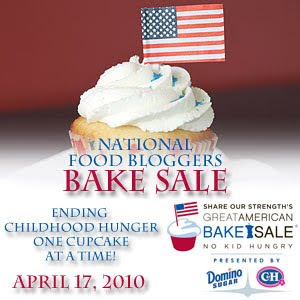 I've always wanted to do one of these "Hunger" bake sales. I hope yours went well!